Certain issues in India require closer attention but have failed to generate enthusiasm to capture enough audience. There probably would be several reasons to this but if you put these issues at the middle of several concentric circles, the outermost and the biggest and strongest barrier is the State itself which underplays most of it. This is a significant challenge and to overcome it would require generating interest and discussions among the citizens. The Centre for Public Policy Research (CPPR) has been constantly challenging conventional planks on which the State justified its existence. This has had the dual impact of creating a critical space in evaluating policies even as it allowed challenging and restricting regulations under the State. 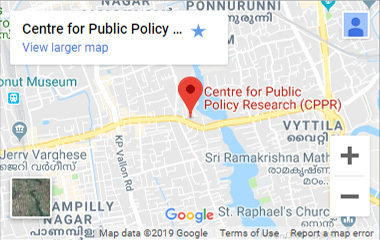 As part of this continuing innovation in understanding ground realities and providing alternatives, CPPR is attempting to generate debates around certain State activities and policies. We project six major issues in this context, based on business largely handled by the State and into which penetration has been literally restricted. These projects are supported by ATLAS Research Foundation, Washington, DC. Understanding each of these issues and alternatives would systematically deconstruct the regulatory environment around us and ensure that growth proceed smoothly and undeterred in the near-term. Lack of public transportation facilities at most parts of the country has a debilitating impact on the overall economic growth. From urban to rural areas, the standardisation of the public transport in the form of buses restricts the availability, affordability and accessibility for the passengers/users of the system. Government prepares policy vesting control of public transport systems in them which limits the mobility in the market and access to institutions leading to social costs of higher order. Here CPPR research tries to analyze the lack of innovation and efficiency in public transport because of the market barriers. In India, The Central Motor Vehicle acts and their counter parts at the States level put up barriers for the Intermediary Para Transit Vehicles (IPT); Auto Rickshaws, Share Autos, Tuk-Tuks etc to be a constituent of the public transport system. CPPR study will look into the role of IPT’s in meeting the mobility needs of Indian population in almost all cities/towns and have been facilitating the last mile connectivity. This is in addition to being the vehicle for the Urban poor. The law however does not legalise the operations of these vehicles as main stream operators of a public transport system. The National Urban Transport Policy of India and the Jawaharlal Nehru National Urban Renewal Mission is worded in favour of government monopoly over urban transport and limits private participation. Recognition of many of such IPT’s systems is vital for enhancing the mobility requirements of people. For eg: the permit system has discouraged the Automobile manufacturers of IPT sector to limit the investments, bring innovation and technical upgrade of the existing vehicles. It is argued that like Mobile revolution, removal of the permits and easing out of the Motor vehicles act would result in a transportation revolution ensuring the last mile connectivity for all the citizens of the country. Given the high density of population and narrow roads in many cities, experts have vouched for IPT systems to serve the mobility requirements compared to Public bus systems. Traditionally this sector has been under government control. All arguments based on morality and the importance to legislate morality flies in the wind when one takes the profits made by successive governments from this sector. CPPR’s research tries to light these opaque liquor policies by raising certain difficult questions including the need to liberalize the sector and ensure competition. We point out that this cosy affair with alcohol which has been continuing for so long and at the cost of the consumers. Successive history of legislations never had any underlining purpose but only to generate wealth in the form of tax for the State. From the specific case of alcohol emerge the issues in trade policies of India. What surfaces is a complicated state of affairs with less transparency and huge restrictions. In addition complicated customs procedures, lack of a single publication ensuring details that a trader would require, service barriers in the various sectors and a range of possibilities in which trade liberalization would have certain benefits have all deterred business in this economy. CPPR raises these issues to foster greater activity which could lead to furthering our trade with the rest of the world. The woes on poor quality have time and again generated reforms in education. But what was considered as reforms opened the Pandora’s Box of corruption and redtapism. Rather than reforming the sector it created profitable platforms not only for the politicians but also for the academicians to talk and write volumes. The sector is as important now as it was at the point when such reforms were necessitated. This has led to some crucial questions that we need to ask the State. CPPR raises these questions in our research. We look at the policy of the State to find out the problems faced by this sector. There are protected trees enmeshed by a series of laws at various levels of the State in India. It is possible that a private individual could face the possibility of prosecution under one or more such laws if he were to attempt cutting one of these trees from his gardens. The State says that much of this has been eased but still we find that no one takes forestry as a profitable investment option. This casts doubts on the claims of the state. CPPR attempts to clear these weeds and shrubs which distance interested businesses from our forests. India has one-sixth of the world population, enough people to compete but no one to translate these competition to medal in international sporting events. While Olympic medals have been rare, internationally competitive sportsmen have been rarer still during this entire period of management of the sector by the state. CPPR points out to a new and emerging direction which has probably changed the game in India: being a sportsperson is now a reputable enough profession. And the private sporting leagues is what made this difference. But these factors require further examination to understand these links and enhance it.